In the furious skies of the Battle of Britain, one aircraft captured the imagination of the British people - it was the Supermarine Spitfire. This diminutive and elegant fighter represented the last hope against invasion by Hitler's unstoppable Blitzkrieg. Reginald Mitchell's innovative design was born of racing seaplanes built to win the Schneider Trophy - the most famous air races of the Twenties and Thirties. The Mk I first flew in 1936 and the type entered RAF service in 1938. Wartime development was rapid. Part of the success story was the Rolls-Royce Merlin engine. As this improved, so did the Spit. The Mk V was built in greater numbers than any other model and provided Fighter Command's backbone during 1941-42. 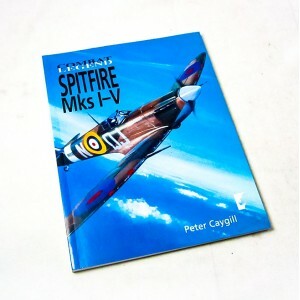 This is the perfect introductory book for the general reader, enthusiast and modeler alike wishing to find a succinct yet detailed introduction to the design and history of the Spitfire. Why was the aircraft conceived? What was it like to fly on a mission? Who were the people who designed it and became famous for flying it? What were its virtues and vices? These and many more questions are answered here, plus a host of illustrations that show variations of color schemes used in different operational theatres and rare photographs taken when the heat was on.